SAMBA: A Dharam Sansad was today organised at Hiranagar at Shri Ram Lila Ground Chowk where in a large number prominent saints from Jammu, Kathua, Billawar, Udhampur & Basohli districts participated under the Chairmanship of Mahant Peer Ravi Nathji Chairman Shath Darshan Sadhu Samaj J&K and resolved unanimously to suggest their disciples and general public in J&K to come out in large numbers to participate in festival of democracy by voting to elect their representative to represent in national government on 18th April. 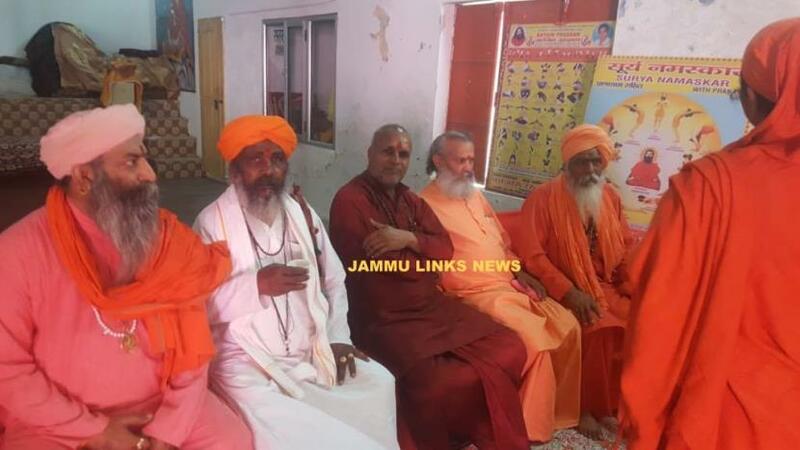 Saints also opined that they look forward for a government in centre which respects Hindutva and works for protecting and promoting Sanatan Dharma and is committed to make Bharat the Vishwa Guru. They all were of the opinion that Narendra Modi is the one who have made all of India proud by running the country in a manner that our culture and heritage demanded, and we all should work and vote to re elect him to power. And to ensure we repeat him as Prime Minister we need to re elect Dr Jitendra Singh, the siting M.P. from Doda Udhampur Parliamentary constituency so as to continue to assist Modi as his Sipahsalar. The saints appreciated the efforts of Dr Jitendra Singh during his first tenure as M.P. and also as MoS in PMO and made special mention of "Devika" cleaning project under "Namami Gange Yojna". Prominent among those who participated in Dharam Sansad included Shri Rajesh Bittu, Mahant Shri Radha Krishna Mandir, Mahant Padamnath Giri saraswati, Mahant Sanjay krishan shastri, Bavishin shastri ji majalat, Vishal mshant Giri, Mahant Makhan Giri dayala chak, Mahant Parspati Giri kog mandali, Mahant Parspati Giri kog Mandli, Gyanveri ji Mahant, Pandit Sushil Sharma ji, Organised by kathua Mandal Sadhu surkshit Samaj and Vote of thanks were given by Dutt Giri.